The premise of this book is that our environmental dilemmas are products of biological and sociocultural evolution, and that through an understanding of evolution we can reframe debates of thought and action. The purpose is to explain the wide variety of environmental worldviews, their origins, commonalities, points of contention, and their implications for the modern environmental movement. In three parts covering the origins, evolution and future of environmentalism, it offers instructors and students a framework on which to map theory, case studies and classical literature. It is shown that environmentalism can be described in terms of six human values—utility, stability, equity, beauty, sanctity, and morality—and that these are deeply rooted in our biological and cultural origins. In building this case the book draws upon ecology, philosophy, psychology, history, biology, economics, spirituality, and aesthetics, but rather than consider these all independently it integrates them to craft a mosaic narrative of our species and its home. From our evolutionary origins a story emerges; it is the story of humankind, how we have come to threaten our own existence, and why we seem to have such difficulty in acting together to ensure our common future. Understanding our environmental problems in evolutionary terms gives us a way forward. It suggests an environmentalism in which material views of human life include spirituality, in which our anthropocentric behaviors incorporate ecological function, and in which environmental problems are addressed by the intentional relation of humans to the nonhuman world and to one another. 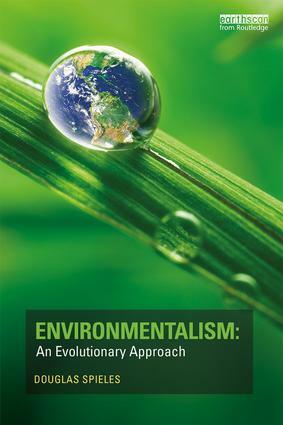 Aimed at students taking courses in environmental studies, the book brings clarity to a complex and, at times, confusing array of ideas and concepts of environmentalism. Douglas Spieles is a Professor of environmental studies at Denison University in Granville, Ohio, USA. He teaches courses on environmental science, ecosystem management, wetland ecology, and geographic information systems. His previous works include the book Protected Land: Disturbance, Stress and American Ecosystem Management.